Lincoln Bowen was born in 1863. He was the son of Dr. Albert H. Bowen and Theodosia Holcombe. Lincoln Bowen married Lottie E. Hewlett. Lincoln Bowen died in 1935. He was buried at Volusia Cemetery, Westfield, Chautauqua Co., NY. Lottie E. Hewlett was born in 1865. She married Lincoln Bowen, son of Dr. Albert H. Bowen and Theodosia Holcombe. Lottie E. Hewlett died in 1959. She was buried at Volusia Cemetery, Westfield, Chautauqua Co., NY. Warner A. Bowen was born on 17 May 1885. He was the son of Lincoln Bowen and Lottie E. Hewlett. Warner A. Bowen died on 22 August 1885. He was buried at Volusia Cemetery, Westfield, Chautauqua Co., NY. Lonnie R. Bowen was born on 7 February 1889. He was the son of Lincoln Bowen and Lottie E. Hewlett. Lonnie R. Bowen died on 15 February 1892 at age 3. He was buried at Volusia Cemetery, Westfield, Chautauqua Co., NY. Fred White was born in October 1887 at IL.1 He was the son of Frank Erwin White and Mary Perkins.1 Fred White married Annie Roony. Edna White was born in February 1890 at IL.1 She was the daughter of Frank Erwin White and Mary Perkins.1 Edna White died in 1917. Olive White was born in December 1892 at IL.1 She was the daughter of Frank Erwin White and Mary Perkins.1 Olive White died in 1961. Frank White was born in January 1895 at MN.1 He was the son of Frank Erwin White and Mary Perkins.1 Frank White married Celia Larson. Frank White died in 1977. Robert White was born in December 1896 at MN.1 He was the son of Frank Erwin White and Mary Perkins.1 Robert White married Lela Stewart; no children. Robert White died in 1986. [S182] Social Security Death Index (on-line), Ancestry.com, SSDI, Ancestry.com, SSAN 468-22-7265. Margaret White was born in 1902. She was the daughter of Frank Erwin White and Mary Perkins. Margaret White died in 1989; unmarried. Elinor White was born in 1904 at MN. She was the daughter of Frank Erwin White and Mary Perkins. Elinor White married Don Sutton. Elinor White died in 1977. Evelyn White was born in 1908 at MN. She was the daughter of Frank Erwin White and Mary Perkins. Celia Larson was born circa 1894 at MN. She married Frank White, son of Frank Erwin White and Mary Perkins. Donald Connell Jr. was born circa 1912. He was the son of Donald Connell and Edna White. Annie Roony married Fred White, son of Frank Erwin White and Mary Perkins. Lela Stewart was born in 1896. She married Robert White, son of Frank Erwin White and Mary Perkins; no children. Marcella (?) married Wallace White, son of Frank Erwin White and Mary Perkins. Don Sutton married Elinor White, daughter of Frank Erwin White and Mary Perkins. Charles Goodyear was born on 29 December 1800 at New Haven, New Haven Co., CT. He was the son of Amasa Goodyear and Cynthia Bateman. Charles Goodyear died on 1 July 1860 at Fifth Avenue Hotel, New York City, NY, at age 59. He was buried at Grove Street Cemetery, New Haven, New Haven Co., CT.
Charles Goodyear was born in New Haven, December 29, 1800. He was the son of Amasa Goodyear, and the eldest among six children. His father was quite proud of being a descendant of Stephen Goodyear, one of the founders of the colony of New Haven in 1638. Amasa Goodyear owned a little farm on the neck of land in New Haven which is now known as Oyster Point, and it was here that Charles spent the earliest years of his life. When, however, he was quite young, his father secured an interest in a patent for the manufacture of ivory buttons, and looking for a convenient location for a small mill, settled at Naugatuck, Connecticut, where he made use of the valuable water power that is there. Aside from his manufacturing, the elder Goodyear ran a farm, and between the two lines of industry kept young Charles pretty busy. In 1816, Charles left his home and went to Philadelphia to learn the hardware business. He worked at this very industriously until he was twenty-one years old, and then, returning to Connecticut, entered into partnership with his father at the old stand in Naugatuck, where they manufactured not only ivory and metal buttons, but a variety of agricultural implements, which were just beginning to be appreciated by the farmers. In August of 1824 he was united in marriage with Clarissa Beecher, a woman of remarkable strength of character and kindness of disposition, and one who in after years was of the greatest assistance to the impulsive inventor. Two years later he removed again to Philadelphia, and there opened a hardware store. His specialties were the valuable agricultural implements that his firm had been manufacturing, and after the first distrust of home made goods had worn away — for all agricultural implements were imported from England at that time — he found himself established at the head of a successful business. This continued to increase until it seemed but a question of a few years until he would be a very wealthy man. Between 1829 and 1830 he suddenly broke down in health, being troubled with dyspepsia. At the same time came the failure of a number of business houses that seriously embarrassed his firm. They struggled on, however, for some time, but were finally obliged to fail. The ten years that followed this were full of the bitterest struggles and trials to Goodyear. Under the law that then existed he was imprisoned time after time for debts, even while he was trying to perfect inventions that should pay off his indebtedness. Between the years 1831 and 1832 he began to hear about gum elastic and very carefully examined every article that appeared in the newspapers relative to this new material. The Roxbury Rubber Company, of Boston, had been for some time experimenting with the gum, and believing that they had found means for manufacturing goods from it, had a large plant and were sending their goods all over the country. It was some of their goods that first attracted his attention. Soon after this Goodyear visited New York, and went at once to the store of the Roxbury Rubber Company. While there, he examined with considerable care some of their life preservers, and it struck him that the tube used for inflation was not very perfect. He, therefore, on his return to Philadelphia, made some tubes and brought them down to New York and showed them to the manager of the Roxbury Rubber Company. This gentlemen was so pleased with the ingenuity that Goodyear had shown in manufacturing these tubes, that he talked very freely with him and confessed to him that the business was on the verge of ruin, that the goods had to be tested for a year before they could tell whether they were perfect or not, and to their surprise, thousands of dollars worth of goods that they had supposed were all right were coming back to them, the gum having rotted and made them so offensive that it was necessary to bury them in the ground to get them out of the way. Goodyear at once made up his mind to experiment on this gum and see if he could not overcome its stickiness. He, therefore, returned to Philadelphia, and, as usual, met a creditor, who had him arrested and thrown into prison. While there, he tried his first experiments with India rubber. The gum was very cheap then, and by heating it and working it in his hands, he managed to incorporate in it a certain amount of magnesia which produced a beautiful white compound and appeared to take away the stickiness. He therefore thought he had discovered the secret, and through the kindness of friends was put in the way of further perfecting his invention at a little place in New Haven. The first thing that he made here was shoes, and he used his own house for grinding room, calender room, and vulcanizing department, and his wife and children helped to make up the goods. His compound at this time was India rubber, lampblack, and magnesia, the whole dissolved in turpentine and spread upon the flannel cloth which served as the lining for the shoes. It was not long, however, before he discovered that the gum, even treated this way, became sticky, and then those who had supplied the money for the furtherance of these experiments, completely discouraged, made up their minds that they could go no further, and so told the inventor. He, however, had no mind to stop here in his experiments, but, selling his furniture and placing his family in a quiet boarding place, he went to New York, and there, in an attic, helped by a friendly druggist, continued his experiments. His next step in this line was to compound the rubber with magnesia and then boil it in quicklime and water. This appeared to really solve the problem, and he made some beautiful goods. At once it was noticed abroad that India rubber had been so treated that it lost its stickiness, and he received medals and testimonials and seemed on the high road to success, till one day he noticed that a drop of weak acid, falling on the cloth, neutralized the alkali, and immediately the rubber was soft again. To see this, with his knowledge of what rubber should do, proved to him at once that his process was not a successful one. He therefore continued experimenting, and after preparing his mixtures in his attic in New York, would walk three miles to the mill of a Mr. Pike, at Greenwich Village, and there try various experiments. In the line of these, he discovered that rubber, dipped in nitric acid, formed a surface cure, and he made a great many goods with this acid cure which were spoken of, and which even received a letter of commendation from Andrew Jackson. The constant and varied experiments that Goodyear went through with affected his health more or less, and at one time he came very near being suffocated by gas generated in his laboratory. That he did not die then everybody knows, but he was thrown then into a fever by the accident and came very near losing his life. It was there that he formed an acquaintance with Dr. Bradshaw, who was very much pleased with the samples of rubber goods that he saw in Goodyear's room, and when the doctor went to Europe he took them with him, where they attracted a great deal of attention, but beyond that nothing was done about them. Now that he appeared to have success, he found no difficulty in obtaining a partner, and together the two gentlemen fitted up a factory and began to make clothing, life preservers, rubber shoes, and a great variety of rubber goods. They also had a large factory, with special machinery, built at Staten Island, where he removed his family and again had a home of his own. Just about this time, when everything looked bright, the great panic of 1836-1837 came, and swept away the entire fortune of his associate and left Goodyear without a cent, and no means of earning one. His next move was to go to Boston, where he became acquainted with J. Haskins, of the Roxbury Rubber Company, and found in him a firm friend, who loaned him money and stood by him when no one would have anything to do with the visionary inventor. Mr. Chaffee was also exceedingly kind and ever ready to lend a listening ear to his plans, and to also assist him in a pecuniary way. It was about this time that it occurred to Mr. Chaffee that much of the trouble that they had experienced in working India rubber might come from the solvent that was used. He therefore invented a huge machine for doing the mixing by mechanical means. The goods that were made in this way were beautiful to look at, and it appeared, as it had before, that all difficulties were overcome. Goodyear discovered a new method for making rubber shoes and got a patent on it, which he sold to the Providence Company, in Rhode Island. The secret of making the rubber so that it would stand heat and cold and acids, however, had not been discovered, and the goods were constantly growing sticky and decomposing and being returned. In 1838 he, for the first time, met Nathaniel Hayward, who was then running a factory in Woburn, Massachusetts. Some time after this Goodyear himself moved to Woburn, all the time continuing his experiments. He was very much interested in Hayward's sulphur experiments for drying rubber, but it appears that neither of them at that time appreciated the fact that it needed heat to make the sulphur combine with the rubber and to vulcanize it. "In the summer of 1838 he became acquainted with Mr. Nathaniel Hayward, of Woburn, Massachusetts, who had been employed as the foreman of the Eagle Company at Woburn, where he had made use of sulphur by impregnating the solvent with it. It was through him that the writer (Charles Goodyear, who makes use all through his book of the third person) received the first knowledge of the use of sulphur as a drier of gum elastic. "Mr. Hayward was left in possession of the factory which was abandoned by the Eagle Company. Soon after this it was occupied by the writer, who employed him for the purpose of manufacturing life preservers and other articles by the acid gas process. At this period he made many novel and useful applications of this substance. Among other fancy articles he had newspapers printed on the gum elastic drapery, and the improvement began to be highly appreciated. He therefore now entered, as he thought, upon a successful career for the future. A far different result awaited him. "It was supposed by others as well as himself that a change was wrought through the mass of the goods acted upon by the acid gas, and that the whole body of the article was made better than the native gum. The surface of the goods really was so, but owing to the eventual decomposition of the goods beneath the surface, the process was pronounced by the public a complete failure. Thus instead of realizing the large fortune which by all acquainted with his prospects was considered certain, his whole invention would not bring him a week's living. "He was obliged for the want of means to discontinue manufacturing, and Mr. Hayward left his employment. The inventor now applied himself alone, with unabated ardor and diligence, to detect the cause of his misfortune and if possible to retrieve the lost reputation of his invention. On one occasion he made some experiments to ascertain the effect of heat upon the same compound that had decomposed in the articles previously manufactured, and was surprised to find that the specimen, being carelessly brought in contact with a hot stove, charred like leather. He endeavored to call the attention of his brother as well as some other individuals who were present, and who were acquainted with the manufacture of gum elastic, to this effect as remarkable and unlike any before known, since gum elastic always melted when exposed to a high degree of heat. The occurrence did not at the time appear to them to be worthy of notice. It was considered as one of the frequent appeals that he was in the habit of making in behalf of some new experiment. He, however, directly inferred that if the process of charring could be stopped at the right point, it might divest the gum of its native adhesiveness throughout, which would make it better than the native gum. "He made another trial of heating a similar fabric, before an open fire. The same effect, that of charring the gum, followed, but there were further and very satisfactory indications of ultimate success in producing the desired result, as upon the edge of the charred portions of the fabric there appeared a line, or border, that was not charred, but perfectly cured. "These facts have been stated precisely as they occurred in reference to the acid gas, as well as the vulcanizing process. "The incidents attending the discovery of both have a strong resemblance, so much so they may be considered parallel cases. It being now known that the results of the vulcanizing process are produced by means and in a manner which would not have been anticipated from any reasoning on the subject, and that they have not yet been satisfactorily accounted for, it has been sometimes asked, how the inventor came to make the discovery? The answer has already been given. It may be added that he was many years seeking to accomplish this object, and that he allowed nothing to escape his notice that related to the subject. Like the falling of an apple, it was suggestive of an important fact to one whose mind was previously prepared to draw an inference from any occurrence which might favor the object of his research. While the inventor admits that these discoveries were not the results of scientific chemical investigations, he is not willing to admit that they were the result of what is commonly termed accident; he claims them to be the result of the closest application and observation. "The discoloring and charring of the specimens proved nothing and discovered nothing of value, but quite the contrary, for in the first instance, as stated in the acid gas improvement, the specimen acted upon was thrown away as worthless and left for some time; in the latter instance, the specimen that was charred was in like manner disregarded by others. "It may, therefore, be considered as one of those cases where the leading of the Creator providentially aids his creatures, by what are termed 'accidents,' to attain those things which are not attainable by the powers of reasoning he has conferred on them." Now that Goodyear was sure that he had the key to the intricate puzzle that he had worked over for so many years, he began at once to tell his friends about it and to try to secure capital, but they had listened to their sorrow so many times that his efforts were futile. For a number of years be struggled and experimented and worked along in a small way, his family suffering with himself the pangs of the extremest poverty. At last he went to New York and showed some of his samples to William Ryder, who, with his brother Emory, at once appreciated the value of the discovery and started in to manufacturing. Even here Goodyear's bad luck seemed to follow him, for the Ryder Bros. failed and it was impossible to continue the business. He had, however, started a small factory at Springfield, Mass., and his brother-in-law, Mr. De Forest, who was a wealthy woolen manufacturer, took Ryder's place, and the work of making the invention practical was continued. In 1844 it was so far perfected that Goodyear felt it safe to take out a patent. The factory at Springfield was run by his brothers, Nelson and Henry. In the year 1852 Goodyear went to Europe, a trip that he had long planned, and saw Hancock, then in the employ of Charles Macintosh & Co. Hancock admitted in evidence that the first piece of vulcanized rubber he ever saw came from America, but claimed to have reinvented vulcanization and secured patents in Great Britain, but it is a remarkable fact that Charles Goodyear's French patent was the first publication in Europe of this discovery. In 1852 a French company were licensed by Mr. Goodyear to make shoes, and a great deal of interest was felt in the new business. 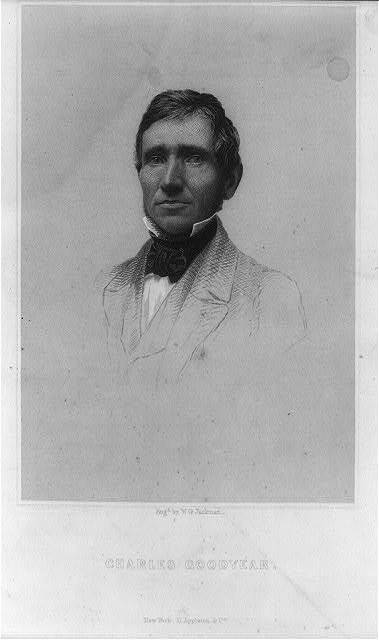 In 1855 the French emperor gave to Charles Goodyear the grand medal of honor and decorated him with the cross of the legion of honor in recognition of his services as a public benefactor, but the French courts subsequently set aside his French patents on the ground of the importation of vulcanized goods from America by licenses under the United States patents. He died July 1, 1860, at the Fifth Avenue Hotel, New York City.